Oh, the irony. 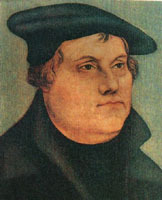 Joel Stein, in his rant against hordes of opinionated Web users, cited Martin Luther and his theses in arguing that a piece should stand alone without commentary. Many thanks to the very snarky Robin Sloan. This entry was posted in web 2.0, writing and editing. Bookmark the permalink. One Response to "Martin Luther strikes back at Joel Stein"